Many of us have been using Sketchbook Pro from AutoDesk to draw and sketch for a very long time. While it is extremely full featured, we generally use it for quick ‘back of napkin’ sketches since it is so easy to change drawing device types and colors. 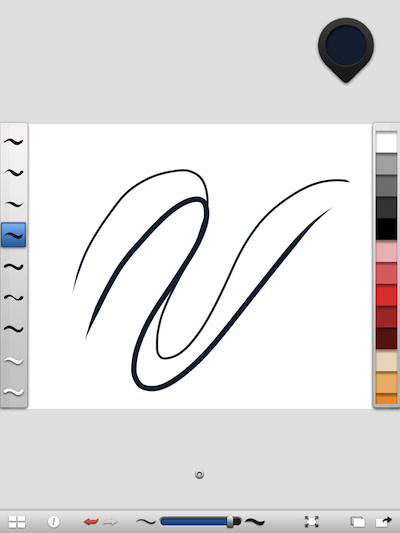 Looking at the new AutoDesk release, Sketchbook Ink, they must have been listening. The iPad app is more about getting very high quality smooth lined electronic ink down on the canvas than it is about super enhanced paintings. Rather than offering drawing devices like pen, pencil, wedge edge pen, etc… Sketchbook Ink offers the style that the drawn line will have. Many folks here are driven crazy by how some apps force you to have a thick line when moving fast or a thick line when your moving slowly, generally apps offer pen widths that change the opposite way from the physical world. Now, you can choose from the seven options down the left side of the page how the pen thickness will react to speed and change in direction. There is even two different eraser types too. Missing though is the ability to set the transparency of the ink line… a feature we are missing with our ink pen on paper in the physical world too. For those new to Sketchbook, the small dot on the lower part of the page hides/shows all of the tools. You can also use pinch zoom and view the canvas full page. The ‘ink’ color picker down the right of the page is not a limited group of colors. 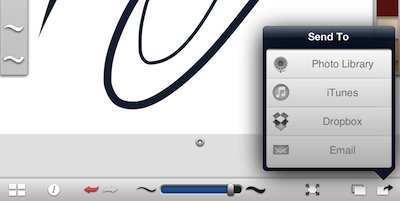 Choosing the circle in the upper right area of the work area will bring up a color picker to highly tune your drawing ink. The colors can be saved to the quick pick bar on the right so you can re-use a color group throughout a drawing without having to return to the picker. 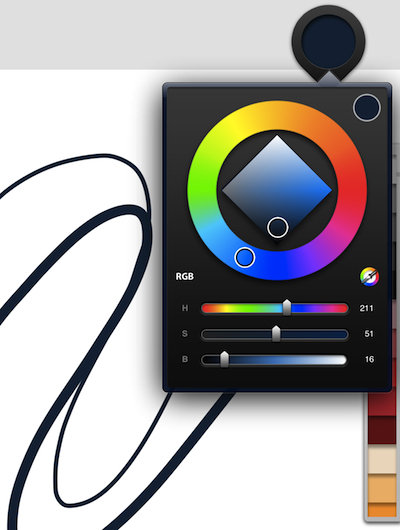 The circle does show which color your are currently working with prior to touching the canvas. You may have noticed the lack of any mention of how to create layers like in the other Sketchbook products, that is because layers are not supported in this version. This has gotten a few folks very upset, but if they want layered drawings there is an app for that. Sketchbook Ink is more about high quality ink on paper type of drawings. Removing a lot of the options normally means a ‘lite’ version, in this case the feature set is different rather than lite from other versions of the app from AutoDesk. Lastly – across the bottom of the Sketchbook Ink page is buttons for you to clear the canvas, undo/redo, adjusting the width of the line being drawn, just to full page and ‘Send To’. Sending a sketch as a PNG attachment to an email or to your iPad’s photo library can be up to 12.6 MP. And, sending a PNG to Dropbox or out through iTunes can be up to 101.5 MP!!! Like we said in the beginning, the app is all about ‘high quality’ ink drawings.